This security poster illustrates the MZU-S Russian Anti-Tank Mine. The mine is described as an anti-vehicle mine, and it stands almost half a metre tall. The mine is thought to be designed to protect mine fields from clearance vehicles. The mine can operate by pressure or command wire. This security poster features an MZU-S connected to the charger/delay setting box and the MZU-S Russian Anti-Tank Mine’s technical specifications. An MZU-S connected to the charger/delay setting box. The MZU-S Russian Anti-Tank Mine’s technical specifications. 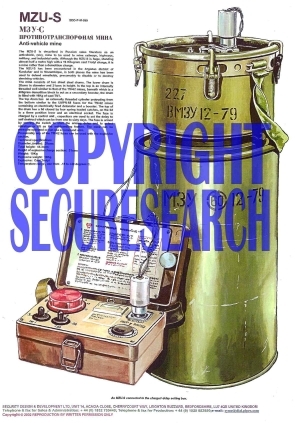 This security poster features an MZU-S connected to the charger/delay setting box and the MZU-S Russian Anti-Tank Mine's technical specifications.